To tmobil from sprint I know service and plans are better and cheaper where im at. If I don't wanna finance a phone, could I buy a used phone and just have T-Mobile activate a Sim card? Also with sprint, phones can have a bad ESN, can gsm phones have that or does that just stay with the Sim card? I just recently switched from Sprint, I wish I had done it sooner. 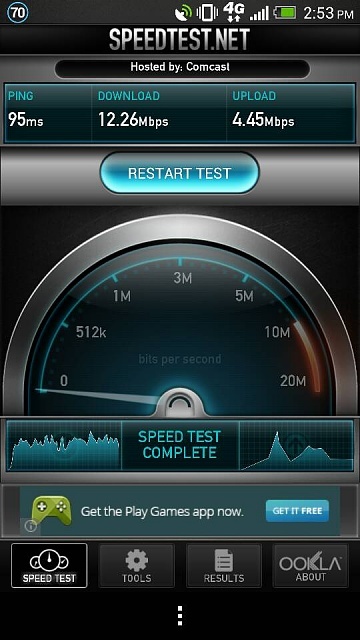 Lte speeds are 30-50 mbps. Yes you can buy a used phone and just activate the SIM. Make sure to buy an Lte enabled phone if you wanna enjoy crazy fast speeds. And gsm phones can also be bad ESN, so be careful out there. If you are referring to being able to check out a phone's blacklist status, it is almost useless to call T-Mobile before the purchase to make sure that the phone is clean. The reason why is that a customer can purchase a phone using the EIP. This phone may not be blacklisted today and that customer can sell the phone. If that customer stops making EIP payments, the phone will be blacklisted later. There are quite a few posts on T-Mobile's forums where people purchased a phone from craigslist, used the phone for about two months, then the phone stopped working. The only way that you can try to make sure this wouldn't happen to you is to meet the seller at a T-Mobile store and verify that there is no EIP balance owed on the phone. If the seller isn't willing to do this, do not buy the phone. Usually sellers that are willing to do this charge higher prices for their phones (so I've heard). Honestly, I would recommend just getting a phone from T-Mobile because there is too much risk involved with T-Mobile phones on the secondary market. Or buying from a trusted source / friend. Thanks for info don't think the switch will happen. They tried suckering me in with the low payment bull crap then told me the same iPhone ( my gf wanted that) was listed on the site for $99. With $27 /month. Would cost me $459. Not paying a $1000 to start two lines for decent phones. Huh? You do know with any carrier you pay for the phones eventually. Either all up front at once when buying price, monthly payments like T-Mobile offers, or through a 2 year contract on AT&T / Verizon. Also if I was told i qualified for no deposit....its prepaid, who pays deposit on a prepaid line. Anyhow is that the same if I were to buy a used phone? If you're really interested in switching. Try calling and talking to there customer loyalty department. I know your going to be a new customer but they are the best for working a deal. I haven't paid for a phone in a long time. Yes right now technically I'm on there payment plan, but I had no down payment and with the deal they gave me on my plan my bill went down 20 dollars from before. How much more are you paying over the life of the contract? That's the important calculation. I was also thinking about moving to T-Mobile before. At the end it was actually cheaper to get my Galaxy S4 with Sprint and keep the same plan! Anyway, T-Mobile doesn't have LTE yet in this area, so the speeds with T-Mobile here aren't as fast as my Sprint LTE speeds. Hopefully, T-Mobile will have LTE in this area in 2 years, when my contract with Sprint is done. I will consider switching by then, but only if either it'll save me money or it isn't that much more but the coverage and speeds justify the extra money! If they redo the HSPA in your area it can be awesome speeds. I got this the other day in the store. I mainly switched from Sprint due to their customer service not unlocking my fully bought phone... But now I'm enjoying T-Mobile speeds and thanks to my discount I pay $70 after taxes so I'm saving about $25 a month versus Sprint. I still dont think the OP gets it. The $99 price point you saw on the website is the subsidized price that the carrier has set. ALL 4 major carriers do this. That phone out right is a 500-650 phone. What T-Mobile is doing is allowing you to bring your own device and pay ONLY the air time usage fees. MetroPCS and Virgini (i think Virgin) you have to pay full price for the phone and get service cheap. Ill take my business line for example. I signed up with TMO and brought my own equipment, $15 for air time (voice / MMS / SMS ) and $20 for data (unlimited) plus taxes. I pay around 50 bucks a month. A few months after the HTC One came out. I thought ok i like it ill get one, what are my options. Option 1 is buy outright for 550. Option 2 is pay $99 down and then 20 payments of $20 added to my monthly bill. I went with option 2. So now my bill is closer to 70 a month. Which is still 10 bucks cheaper then what i was paying with Sprint before I left them. Once the phone is paid off im back down to 50 bucks a month. I can also pay my phone off early if i want. SO if i get a great christmas bonus and pay it off early BAM im back down to 50 bucks a month for my montly air time bill. But wait, with Sprint my bill was always the same. I was with them 11 years and many of those years i was out of contract and using a used device i paid full price for. So for me the T-Mobile pricing model makes a whole lot of sense. As far as you justifying not paying 3/4 rent thats a bad comparison, in my opinion. On your example you would have paid $27 a month for that awesome phone you wanted. Thats the rent to own price. With the $459 price thats the i paid for i own it price. Its a one time fee and your monthly air time would be cheaper. With all the used iPhones and Android units out there its an awesome idea to buy a good used device then go to T-Mobile and pay just the air time usage. Its one of the main reasons i switched. That and the fact that Network Vision caused my Sprint device to get texts really late, missed a lot of calls and data speeds were worse. 4 months into Sprint LTE roll out in Dallas i couldnt get LTE where i worked or lived. But When T-Mobile switched on LTE i got it day one at home, at work, and many other places.. So yeah I went from being a Sprint fan boy to a T-Mobile fan boy and im proud to say the grass is way greener on this side of the fence. I'm a little confused as to what you are saying here. If T-Mobile qualified you for new service with no-deposit, you were looking at postpaid service. The downpayment and JUMP are only available on postpaid lines. If you were signing up for prepaid service, then yes, you have to buy the phone upfront with no payment plan. You have to qualify for the discount rates. They have to run credit. The rate plan is month to month / post paid but the device is being sold to you on a subsidy and you pay it out over time. That is like a contract. You are agreeing to get the phone either free or with a deposit on day 1 then each month pay X amount of dollars for 20 months. So you have to be approved for it. Were you approved for it? Did they run your information? Were you actually calling T-Mobile or some 3rd party reseller for them? My advice, since your having problems understanding how this works and / or getting bad or mis information from these phone calls. Go into a T-Mobile corporate store. It's pretty basic. Pre paid-you pay 450 for the phone, own the phone and buy minutes/data as you need. Post paid- you sign up, they run your credit and determine if you need a down payment to start an account with them on a monthly basis. Then based on your credit they charge you for the phone, as long as your credit is fair, they give you whichever device you'd like at the down payment price, which you'd pay then. The remainder of the cost of the phone is paid in typically 20 dollar payments for 24 months or less if you'd like. It sounds to me like there is an issue regarding credit, or you're not understanding the terms of the sale for 99 dollars. I've been with tmobile for a few years now and never had to pay full price for a device, always subsidized it and paid the old device off early when I got a new phone. Isn't it 99 dollars + tax down. Then 20+ dollars a month per phone on your bill until you pay off the balance of each phone? What are different ways to update version of Android? Does anyone have a picture of what the battery cover of the Note 3 that will be released on Verizon? RUMOR: BBM to be landing at the end of october? !